The restoration of the interior of Lew Wallace’s Study is complete. The first step in the process was the demolition of the old wiring and electrical system and the installation of new wiring. The project was completed by Glenroy Construction, with the electrical work being done by Electric Plus. Dane Macy and Tim Whicker from Electric Plus worked very hard with Dave Kroll of Ratio Architects to determine the best way to remove old material and install new material with a minimum amount of damage to the historic fabric of the building. This work was complicated because the original wiring was installed prior to the finish plastering. Further, the installation of the wiring in the 1890s was handled differently at each of the three levels in the main room so the same approach did not work throughout the building. We learned much about the manner in which the plastering and original wiring was done that we will include in our institutional archives and share with interested visitors. We have now completed the second phase of the project as we begin the dramatic restoration of the interior paint finishes as created by Wallace 120 years ago. One dramatic discovery during this process was that, rather than eight vignettes, we had thirty-two, and they were 95% intact! The work done by the talented restoration team has revealed the tastefully elaborate Victorian finishes Wallace enjoyed. During restoration efforts in 2011, a detailed paint analysis of the interior hinted at the possibility of an elaborate paint finish. Conservators were hired to remove nine layers of over-paint to see what might survive from the 1890s. 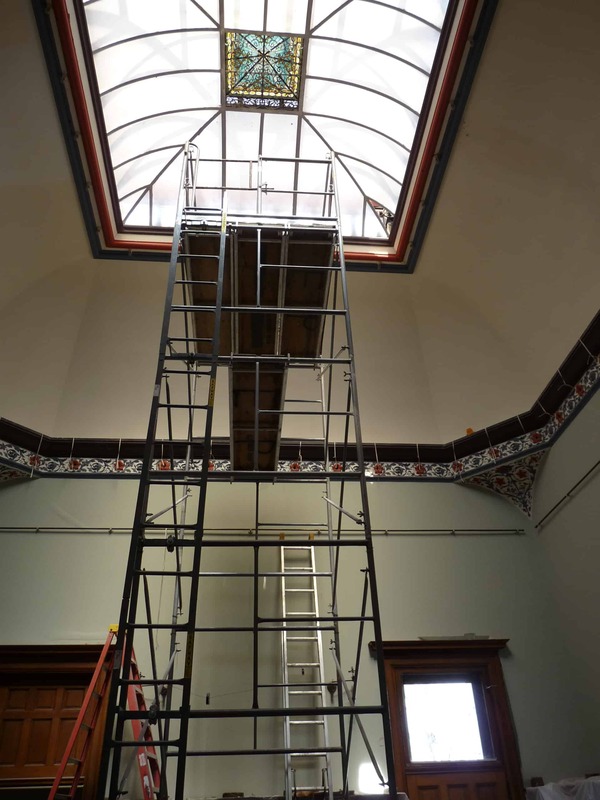 After initially failing to find the hidden artwork, conservators reexamined Ella’s written words and noted she said the artwork was “around the skylight.” They went farther up on the dome to the perimeter of the skylight and there it was! Following Ella’s description, the conservators located a fife and drum in the southeast corner of the dome and a section of the chain that will someday again link the elements of the military motif. Beyond the fresco design, the original painted finishes include an unusual color scheme that fades from dark to light blue in the main room and a dark red and gilded design in the entry vestibule. Additionally, the elaborate plaster floral band that surrounds the main room was gilded so each individual light sparkled. To see where we’ve been with the fundraising campaign and our generous donors, please visit our Making A Historic Difference Campaign Page.